Mark Schofield has finalized his QB prospect rankings for the NFL Draft, based on film study of each of these players. Here are Mark’s top 14 QBs in this year’s draft class. Very talented and athletic quarterback who displayed the ability to work through reads and progressions in 2014. Able to squeeze throws into tight windows when necessary, and is elusive in the pocket with the ability to escape pressure, extend plays and improvise when needed. Will need to improve his footwork, but takes care of the football (in the passing game) and can win from the pocket. Ready for the professional game from an on-the-field standpoint. Two years in an NFL-style system where he was tasked with making reads and progressions on most every play. Worked under center more than most quarterbacks in this draft. Tremendous arm strength with a very quick release. Forced many throws into coverage in 2014 and showed baffling decision-making at times. Transgressions away from the field are a concern. Likely has a higher floor than Mariota given his experience in a pro-style offense, but Mariota has more room to grow. 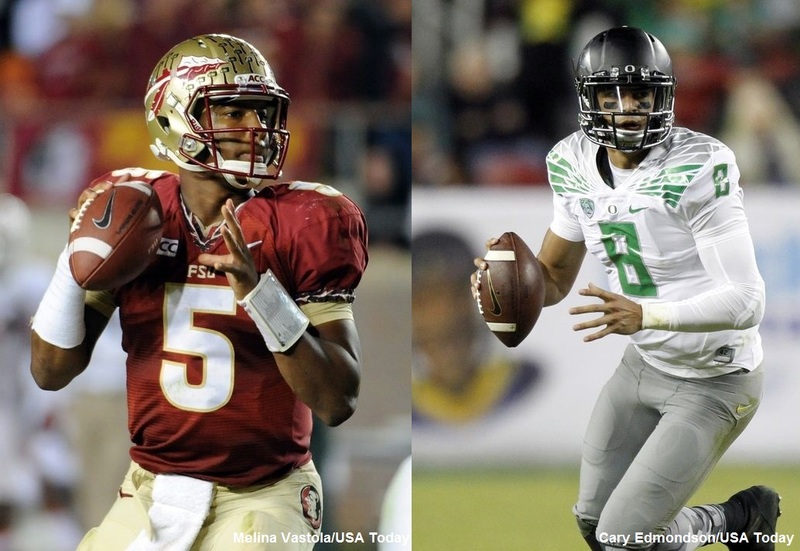 After Mariota and Winston, Bryce Petty is the next quarterback off my draft board. The Bears quarterback has a very strong arm and is an extremely tough competitor at the position. Decent footwork despite working from the shotgun in Art Briles’s offense. Needs to improve his accuracy, especially in the vertical passing game. A very talented athlete who is explosive running with the football. Very strong arm. Inconsistent in the pocket. At times he seems extremely comfortable gliding away from pressure and climbing the pocket, but other times his internal clock is a mess and he cannot wait to tuck the football and run. With polished mechanics and a year to develop, he could be a long-term fix for a team at the position. Talented quarterback with experience under center and making reads from the pocket. Throws the football very accurately and operates well when on the move. Mechanical issues exist, especially a pronounced windup that delays his release and exposes the football to defenders in pocket traffic. Tends to lock on to receivers and needs to work on keeping his eyes moving and the secondary guessing. An unknown commodity to most outside of draft circles, the standout for the ThunderWolves led his school to the Division II National Championship. A tall quarterback who stands 6’7”, Bonner is the most experienced QB in a pro-style offense other than Winston. He is very adept in the three-, five- and seven-step game, but throws very well on the move for a quarterback of his size. Will face questions about his arm strength and the level of competition, and needs to add a few pounds to his frame, but might be the steal of the draft at the quarterback position.